1. You must tuck bottles away for years – maybe even decades – before enjoying them. 2. You need a cool basement for their storage. Full stop. What?!?! Is this at all possible? Yes!!!! Today, most of us buy wines when we are ready to enjoy them. Luckily, most wines crafted today are fit to be consumed upon purchase. While people’s cellaring and drinking habits were changing – moving into major population centers with less space for a cellar, requiring them to buy wine just before they consume it – so was winemaking. Now, for many wines, the need for a “cellar” of sorts is primarily to have wines on hand to enjoy for any occasion. Of course, many wines will age well, even if they drink nicely today. So, a well-rounded wine cellar collection tends to be a “living” or “working” wine cellar. It holds wines ready to drink now and wines to drink over a range of years. The latter could be wines you’ve read about, have tasted on winery visits or have been gifted on special occasions, for example. Remember that wines do change with age, their fresh fruit characters turning into flavors of earth, fallen autumn leaves and mushrooms, among others. Make sure you like sipping these older wine styles before you painstakingly mature wines in your cellar only to wind up disappointed! Additionally, some wine lovers collect to resell. The collection resale market is alive and well, but the main players barely amount to a few thousand globally. The number of wines fit for resell is relatively small, too. Flipping or scrolling through catalogs from major auction houses - such as Christie’s, Sotheby’s or Zachys - or reading the news from a wine trading site like Liv-Ex will give you an idea of how to collect for resale. To start a working wine collection, why not start with the wines you love the most? Do you crave a brisk Sauvignon Blanc? Should every weekend start with a bottle of bubbly? Is a bottle of Cabernet Sauvignon or Pinot Noir the go-to for Sunday lunch? For your everyday consumption, it’s worth pausing to gauge how much you consume of different wine styles. If you seldom pop open fizz, there’s no need to buy a few cases of different kinds, unless you like older sparklers of the style you’ve bought and know they for certain that they will age well. To that end, if you are captivated by wines you love that can also age well, go ahead and buy a half or full case. (Wine usually is packaged 12 bottles to a case. However, many high-end wines come in six-packs.) I spent the early days of building my wine cellar collection buying a bottle here and a bottle there. This tactic helps achieve style diversity more quickly and is easier on the monetary and storage space budget (I live in New York City). The flip side is that I’ve not been able to follow many a wine’s course of evolution that might have been fun. I’ve often wished I’d bought at least two or three bottles. At the same time, consider that palates definitely change over time, whether it is age (of the person, as well as the wine) or trend. With that in mind, if you are just starting your wine cellar collection, it might make sense to buy with a bit of restraint in the first half decade. All of our interests continue to evolve, as do those of winemakers around the world. So, do leave room for some evolution! Speaking of budgets, many a large wine collection has become a sparring point, encouraging heads of households to counter one another by collecting more handbags, more watches or other such items. Don’t say you weren’t warned! So, consider how much you’d like to spend annually. Monthly budgets aren’t realistic for larger purchases when good purchasing opportunities arise for precisely what you want. Then, do your price-shopping homework on wine-searcher.com and become familiar with the major sales events of your favorite retailers or opportunities to buy direct from your wineries you frequently visit. At the very least, take advantage of the case discounts offered by most retailers. Many give discounts on mixed cases, too. Signing up for the Kendall-Jackson newsletter or following them on Facebook is a great way to stay in the know on exlusive offers. The second budget consideration is the physical space to properly store your wine collection. Moreover, you don’t just need space; you need the ideal conditions for your wines to mature. All of your wine collection will age. The question is how will it age? If properly stored, it will age more gracefully and more slowly. Can you build a home cellar in a closet? Are you a city dweller living in an apartment? Check out my piece on the best way to store wine properly - from storing wine in the fridge to wine cellar temperature and humidity to light and movement and beyond. Building a temperature and humidity-controlled wine cellar at home requires professionals. There are many major factors to consider, from energy and insulation to racking and aesthetics. Major projects require special cooling units accompanied by ducting. Depending on your situation and goal, don’t shortchange this part of the project. 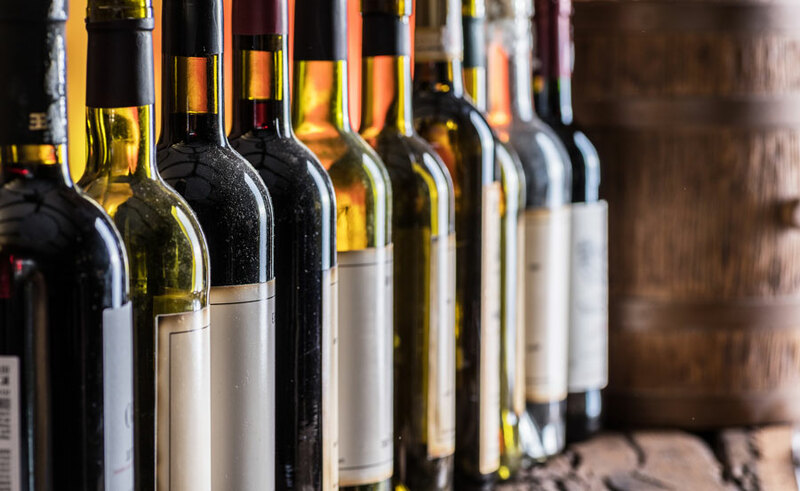 If you are lucky enough to have a space that fits the outline of the best way to store wine properly, your home wine cellar might be closer to realization than you’d expect. There are highly reliable digital thermometers and humidity meters that can help you keep your home-built wine cellar in acceptable ranges. Ideally, they would have a smart-phone alert option to help you keep tabs on unusual swings in environmental consistency. A true wine cellar is different from a wine fridge in that the first is a room or series of rooms or connected spaces dedicated to wine storage while the latter is a self-contained, refrigerated unit available in various sizes that is effectively a piece of furniture. If you decide that you don’t have the space for your wine cellar at home, you can opt for professional wine storage for very large collections or purchase one or several large wine fridges of varying sizes. Or, there’s always the possibility to combine any of these options! Keep in mind that most wine fridges hold fewer bottles than they claim and can be louder than built-in systems. (Thermoelectric cooling is much, much quieter than old school compression cooling.) Two interesting features of many wine fridges is that they sometimes allow for dual zone cooling (that is, a colder zone for white and a warmer for red), and that their doors are often reversible, depending on which side you need to have them open for easy accessibility. 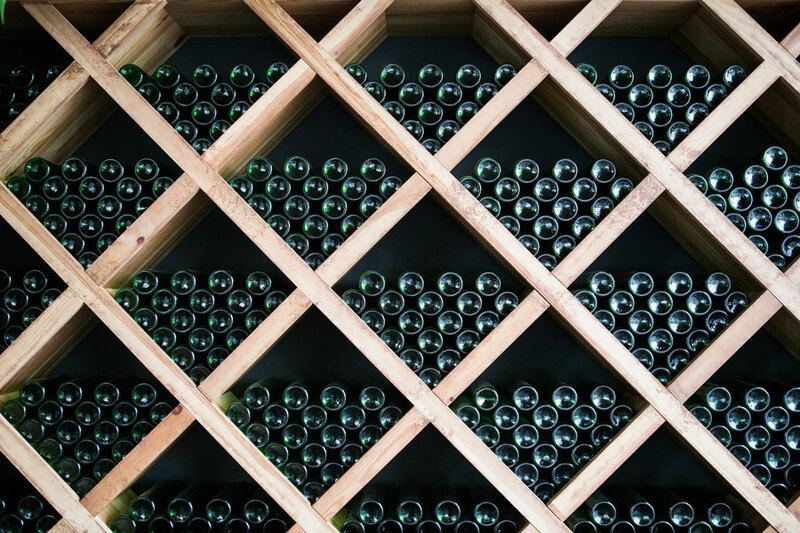 Organizing a wine cellar should be based on how you drink wine. Classically, however, a wine cellar is organized by predominant grape variety or origin. If a wine cellar space is large enough, it might also be further segmented by wine vintage within a varietal or provenance organization. This is still a good way to line-up wines for those bottles that you are collecting cases for mid-to-long term drinking, gifting or re-selling. However, for wines that will be drunk up in a matter of months, you may as well situate them at the beginning of the cellar or at eye-level in the cellar or at the top of the wine fridge. For age-worthy wines that you might be tempted to pick at but are trying to avoid early on, put them in harder to reach places: very high or low or at the back of the cellar. The most important wines for wine collecting are those that further your interest and pleasure in wine. The wines that prompted you to read this article are the ones that should be essential for the initial development of your cellar! Wine collecting isn’t just about today or investments or things that might be lovely to sip in the future. There are many thoughtful approaches to wine collecting, especially when you share your wine passion with others. Birthday years and anniversary years are classic places to start. When you are interested in gifting wines, it is important to consider that the best winemakers make very good wines every year, even if it is a difficult year. By contrast, if a winemaker doesn’t make an amazing wine in a great year, what’s the point of buying those wines? It is crucial to consider this when looking to collect for specific years. Finally, and a bit of an aside, but know that you’ll never drink every bottle. Passing on part of your carefully selected cellar is one of the joys of wine collecting! Wedding wine gifts are particularly fun because you set up a wonderful moment for those closest to you to enjoy at any date in the future. Whether you chose to set up the happy couple for a hand-chosen, once-a-month collection of wines or a series of wedding anniversary wine gifts, creativity is your only limit! There’s also the gift of a wine club membership. The suggestions below include not only wine, but also wine accessories. 1st Wedding Anniversary: Paper – A beautiful tasting notebook is a great way for the happy couple to preserve memories of excellent bottles. Accompany this with Label-Off, so that the pair can preserve their favorite (paper) labels in their new book, too. 2nd Wedding Anniversary: Cotton – Cleaning wine glasses well means using lint-free towels to dry them. Flour sack towels (100% cotton) are terrific and can easily be found in plain white or with humorous sayings. 3rd Wedding Anniversary: Leather – A beautiful leather wine bottle carrier is a primo fit for this celebration, whether it be for carrying about town or on a trip or for biking around. 4th Wedding Anniversary: Fruit & Flowers/Linen & Silk – This anniversary is rooted in finesse, so a wine that drinks the same is in line. A young Pinot Noir is fruit-driven and has silky tannins, making it a perfect fit for this milestone. 5th Wedding Anniversary: Wood – Any barrel-aged wine will work. Luckily, almost all bold red wines are aged in oak. Just about any Cabernet Sauvignon, Merlot or Syrah will work! 6th Wedding Anniversary: Iron/Candy – Candy is sweet, and dessert wines are made for after dinner. Sweet wines are a great way to help your favorite couple round out their cellar. 7th Wedding Anniversary: Wool/Copper – Depending on your zip code, this wedding anniversary gift suggestion may not be as easy to find. There are some edgy winemakers, especially in Italy’s Friuli region, Slovenia’s Brda region and Georgia (the country), that make white wines with skin contact. This gives the wines a copper color. Alternatively (and likely easier to find), many pale rosés have a tinge of copper to them, too! 8th Wedding Anniversary: Pottery – Following on the seventh wedding anniversary, for the pottery anniversary you could look for a wine made using ancient methods and made in qveri (from Georgia, the country) or anfora (Italy, Slovenia and Croatia especially, but found in many parts of the world now). 9th Wedding Anniversary: Tin/Aluminum – Keeping a couple that is racking up the years together trendy can be easy. There are many fun wines packaged in aluminum cans these days! 10th Wedding Anniversary: Steel – By contrast to the 5th wedding anniversary gift of wood, this year of marriage could be celebrated by a wine aged only in stainless steel. Many white wines are unoaked, like Sauvignon Blanc and Pinot Gris. Additionally, if you want to give the happy couple a series of wines that are to be enjoyed over the course of their years but want them to have something in hand now, Wine Away is a great way to protect the couple from inevitable wine splashes to come through the years. To sum up, there is no one clear way to start a wine cellar. Your own path is part of the art. Nonetheless, hopefully these suggestions will be helpful and lead to many moments of happy sipping! Looking for more educational wine articles? Visit our entertaining page.